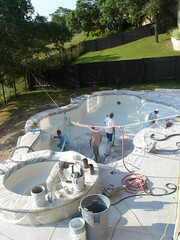 The pool is getting very close to completion! The now outdated as I'm just now getting to writing this post and we're actually already swimming in our new pool latest pictures of the pool are below. Maybe it's because I'm still high on cloud nine about actually getting my own pool but I've found this whole 'pool building' process extremely interesting. I think I want to build pools now. This whole 'activity' has been amazingly easy and I'm thrilled with the results so far. Everything but the landscaping is done and will be shown in the next (and last, I promise) pool post. Applying the 'Pebble Sheen' plaster. My kids wanted to zip line on it. I said 'Um...probably not'. So, when do we get the photos of you chillin and floating around in the pool with your icey "beverage" in hand? Okay, I seriously need to find that high paying job so I can take a long weekend and come splash around in your pool! I said August, but...that HPJ hasn't come along yet :( Enjoy! Cool, Kristine. Now your neighbors are going to be super jealous - maybe they'll have a new pool soon! Enjoy your hot weather. After a hot week (for us), it has cooled off and we've had little sprinkles of rain but not enough for what we need. Can't seem to get the weather just right! WLW, probably never as I refuse to be photo'd in a bathing suit. Sonja - don't forget 'everythings bigger in Texas' ie. most of my neighbors already have pools and they're bigger than mine! I'd love to come see it one day.